Ukrtransgaz and Gaz-System take a step toward the construction of the new pipeline. The planned gas interconnector Poland-Ukraine includes the construction of a new gas pipeline between the gas hub Hermanowice on the Polish side and Bilche-Volitsa on the Ukrainian side. The organizers expect that the new interconnector will increase the annual capacity to 5bn cu m in 2020, when the expansion of the national gas transmission system in Poland is planned to be be completed. 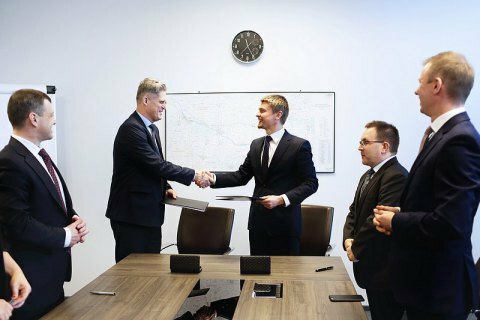 The agreement provides for cooperation of gas transmission system operators in the field of design and construction works. The agreement shall regulate on the cooperation of both operators during the design stage, and, depending on the investment, during the further implementation phase. "The agreement also provides for the possibility of the Open Season procedure, which is aimed at the dictated by commercial and business considerations expansion of the national gas transportation system, primarily the confirmation of the actual interest in the market. The two operators will take the final decision on the investment based on the Open Season results, in agreement with national regulators and in accordance with the legislation of Poland and Ukraine," reads the statement. Earlier, presidents Petro Poroshenko and Andrzej Duda agreed that the construction of the pipeline Ukraine-Poland should start as soon as possible.